The Titans survived a tough week of matches, including a two-game slide, but rebounded to win their final league game and take the Intermountain League title. They enter the postseason ranked 23rd and will face the 10th-ranked Salida Spartans in the first round of the state tournament on Friday, October 28. It was destined to be a rough finish for the Crested Butte Titans soccer team, closing out the regular season with five games in seven days, four of which were on the road. Furthermore, they lost standout central defender Alden Watkins to injury, leaving the coaches to shuffle players to fill in the gap left by his loss. With the Titans sitting at the top of the league heading into the final week, every team they faced had everything to gain and nothing to lose, and they played like it, giving the Titans fits every step of the way. The Titans opened the final week with a tie and a win but soon encountered their lowest point of the season, starting with their match against the Ridgway Demons on Tuesday, October 18. The Demons are notoriously tough on their home field and proved to be the better team on Tuesday as they handed the Titans a 2-0 loss. Crested Butte had one day of practice to regroup before returning to the road to face the Telluride Miners on Thursday, October 20 and the hope was that the Ridgway loss would serve as a wake-up call for the Titans. “I thought the team would bounce back, play a good game and get a good win against our rival,” says Durgan. Instead, the Titans continued to play sluggish and erratic soccer. Crested Butte took a 1-0 lead in the 10th minute when Patrick Seifert blasted a shot from 20 yards out, but the wheels proceeded to fall off as Seifert picked up two yellow cards in a matter of eight minutes, and the Titans had to play a man down for 65 minutes of the game. Furthermore, Telluride’s star Brazilian exchange student was running rampant through the Titans team. Defenders Tate Young and Dylan Eaton were solid in the match-ups against him yet he still found seams in the Titans defensive third. With the Miners pressing, the Titans struggled to establish any semblance of possession and continued to miss passes with hurried clears and panicked play. The Miners soon tied the game and then built a 2-1 lead by halftime. Freshmen Kye Matlock, Chris Myers and Carlos Franco were called on to play during the final week and they stepped into the mix against Telluride bringing a more composed style of play to the field, but the Titans still struggled to put together any semblance of a cohesive attack as the play of the Titans was erratic and, at times, listless. The nail in the coffin came in the 60th minute, when the Miners were awarded a penalty kick and they converted, giving them a 3-1 lead. Five minutes later they struck again to put the game out of reach 4-1, eventually handing the Titans their second loss in a row. That left the Titans one final game to save their season and the league title when they returned home to host the Bayfield Wolverines on Friday, October 21. Just one week earlier the Titans tied Bayfield 1-1 and questions circulated about whether the Titans could turn things around for the final game. 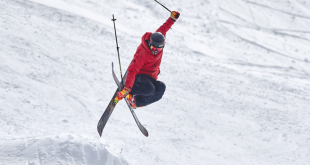 “I wanted to see intensity and executing the things we practiced all year,” says Durgan. Crested Butte established control of the game early, yet Bayfield matched the Titans every step of the way with their hustle. The effort of the Wolverines made the difference as they scored first and took a 1-0 lead into halftime. Remarkably, after losing two games in a row and falling behind 1-0 to Bayfield, Crested Butte turned it around in the second half to take control of the play as Bayfield appeared to back off, hoping to just hang on for the 1-0 win. The Titans tied the game in the 60th minute as Jordi Nichols chipped the ball over the Bayfield defense to Merlin Mapes and Mapes buried the shot as the keeper came out. Five minutes later Cam Curtiss carried the ball to the end line to find Nichols open and Nichols turned on two Bayfield players to find an opening near post, tapping the ball through to put the Titans up 2-1. 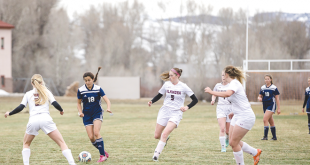 With the Titans’ midfield working hard and the defense in complete control, Crested Butte held strong to seal the 2-1 win and the league title. “The win was huge and it should help bring back the team’s confidence and help build momentum for the playoffs,” says Durgan. Now it’s on to the post-season for the Titans as they head to Denver on Friday, October 28 to face Salida in the opening round of the state tournament. A win will put them through to the second round on Saturday; a loss will put an end to the season.